FMGE 2017 - Commonly known as Foreign Medical Graduates Examination, FMGE is an evaluation exam to allow Indian nationals with foreign medical qualifications to practice in India. 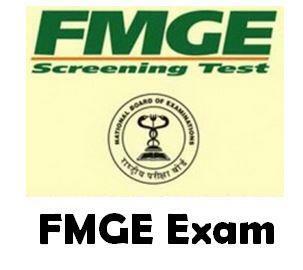 FMGE is conducted by National Board of Examinations (NBE) twice a year i.e., June and December. The examination scheduled in December will be held on December 21, 2017. FMGE is held for medical graduates wishing to get a provisional or permanent registration with Medical Council of India (MCI) or any State Medical Council (SMC). Aimed at assessing the in depth knowledge of a candidate, FMGE was made mandatory in the year 2002 for all Foreign Medical Graduates (FMGs). The online registration process for the FMGE 2017 will be opened by October end week and the FMGE 2017 results will be announced on January 21, 2018. Interested candidates can check the important information and eligibility criteria of FMGE 2017 December session before filling up the FMGE application form 2017 The NBE has the authority to revoke an applicant’s candidature in case he/she does not full the eligibility criteria for the FMGE 2017 examination as laid down by the exam conducting authority. Applicants can check below the important information for the eligibility criteria, application details, important dates, exam schedule and results for FMGE 2017 December session. An Indian Citizen or Overseas Citizen of India possessing a Primary Medical qualification awarded by any Medical institution outside of India who is desirous of getting Provisional or Permanent registration with State Medical Council. According to the official brochure of FMGE 2017, “An Indian citizen/Overseas citizen of India possessing a primary medical qualification awarded by any medical institution outside India who is desirous of getting provisional or permanent registration with the Medical Council of India or any State Medical Council on or after March 15, 2002 shall have to qualify a screening test conducted by the prescribed authority for that purpose as per the provisions of section 13 of the Act”. The FMGE 2017 online application for the month of December can be obtained in the last week of October tentatively. The application form for the FMGE 2017 December session exam will be available in online mode. The candidates must note that the form is available through online mode only and no other mechanism to fill the application form for FMGE 2017 exam. Candidates are advised to thoroughly check the eligibility criteria of FMGE 2017 December session exam before filling the application form. NBE reserves the right to cancel the candidature of an applicant if he/she does not fulfill the FMGE eligibility criteria. The prescribed fee for taking the FMGE 2017 December session examination on 21st December is Rs. 5500/- which is non-refundable (under any circumstances) and includes the information bulletin. The amount can be paid either through net banking or through payment gateway provided using a credit or debit card. After completing the Registration and Scheduling process for FMGE 2017 December session, the applicant will get a computer generated acknowledgement on his/her registered email ID. NBE also sends the SMS alert notifications to the candidates’ registered mobile numbers and email ids. The candidates can then download their admit card by logging on the FMGE website and print a copy of their application form. The weightage of MCQ’s in each speciality will vary, NBE has the right to alter/vary/amend the marks of the questions. The question booklet pattern will be based on the MBBS programme curriculum. Candidates can check below for the highlights of NEET exam pattern. Candidates can also take up a dummy exam for FMGE 2017 December session to acquaint themselves with the feel and functionality of actual online test format on the official website. They can access the demo test for the FMGE 2017 December session from November 2017 (Tentative) onwards by entering their testing ID (issued upon successful completion of the registration and scheduling process). Candidates are advised to go through the Demo Test pattern carefully to familiarize themselves with the screens, navigation and layout of the FMGE exam. The result for FMGE 2017 December session will be announced on 21st January, 2018. The results will be declared in an online mode in the form of scorecards. The scorecards of FMGE 2017 December session will comprise a candidate’s details along with the marks and ranks secured. The applicants can check the results for FMGE exam on the NBE website. The minimum cutoff marks required to crack the FMGE 2017 December 2017 exam are 150 out of 300 i.e., the applicant has to score a minimum of 50% marks to pass the exam as per the statutory requirement under section 13(4A) of the IMC Act, 1956 amended in 2002. Candidates who make it to the list will be confirmed as ‘FMGE 2017 qualified’. Only the Indian national candidates or overseas citizen of India are eligible for applying. The candidates who hold the Primary Medical qualification from a Foreign University, must confirmed by the Indian Embassy, which to be recognized by a Medical practitioner (approved by MCI) in the country stating that qualification is situated. Cut-off date for obtaining the Primary Medical Qualification is on or before 30th May 2017/ 30th November 2017 for June and December secessions respectively. 1. He/she must be a bonafide citizen of India or Overseas Citizen of India (OCI). 2. He/she must possess the requisite primary medical qualification either whose name and the institution awarding it are included in the World Directory of Medical Schools, published by the World Health Organization; or which is duly attested by the India Embassy to serve as a recognized qualification for enrollment as the medical practitioner in the country in which the institution awarding the said qualification is situated. 3. Candidates seeking provisional or permanent registration and holding undergraduate as well as post graduate medical degrees from the following countries do not need to undertake the FMGE exam as they can register themselves directly with MCI or any SMC. 4. Candidates failing to meet the eligibility requirements for the FMGE exam will not be given admission under any circumstance. 5. Candidates are advised to read the official brochure of FMGE 2017 in order to understand the eligibility criteria.